Minnie Paws is one smart cat because she lives in the library. This summer the elementary school did a huge remodel, even moving the library. I helped with decorating the library and it’s been a ball. In another post, I’ll share with you some pictures of the new library, but in this one I’d like you to meet Minnie Paws and give some ideas on how she can recommend books. You’ll find the tutorial for making “Minnie…the Smart Cat” in the Miscellaneous Projects Gallery tab in the sidebar. I think the kids in all the upper elementary grades could do this project, so I’m not specifying a particular grade. 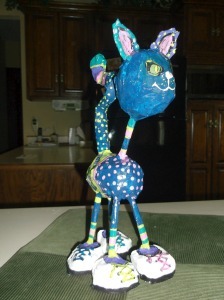 This entry was posted in Categories, Miscellaneous and tagged cat, cat project, craft, elementary, grades, kids, kids art project, library cat, minnie paws, minnie paws one smart cat, paper mache, project, smart cat. Bookmark the permalink.